Writing a goodbye letter passes on your love and your legacy. Yes, I am talking about a goodbye letter to be read after your death. Note this: I am absolutely not referring to a suicide letter. If you’ve found this blog post because that is what you are considering, go and ring for help immediately. Google ‘suicide help line’ and your location. Life can be better, I know you probably do not believe that at the moment, but in this world things change, always. 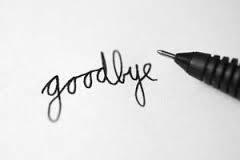 No, the goodbye letter I am referring to is, believe it or not, meant as a positive and life-affirming experience. That said, parents have a hard enough time writing wills and here I am suggesting writing a goodbye letter! I think parents need to write such letters as soon as they become parents. Why? Because you never know. You never know. Want another nicer reason? In my newest eBook, Know Your Mission to Reach Your Goals, I suggest writing a goodbye letter as a way of focusing more clearly on what you want from life. Knowing what you want from life sets a good example for those you love. A final reason: such letters document a bit of each child’s life. Tip one: Write one a year for each of your children. Tip two: Write it on each child’s birthday. Tip three: Make certain a trusted person knows where you keep the letters. Tip four: Decide the age when you want your child to get the letters. I have watched your growth this year, you have learned to crawl, then to walk, and now you are pointing to things and looking at me to name them. Having you, watching you grow, has filled my heart in ways I never thought possible. I look forward to many years in which to show my love and share your joys and comfort your sorrows. If you are reading this letter and it is the last one in the series, I died shortly after writing it. Bad things happen. Not as punishments or lessons, but just because life brings good and bad to all. I know you probably have no memories of our short time together. It is even possible your father remarried and you learned to think of someone else as your mother and came to love her as you would have loved me. I hope that is what happened. I also know that when a parent dies while their child is young, the child often feels to blame or at fault. The child can also feel angry or personally betrayed and have a hard time trusting others. Those are normal feelings, but hopefully get left behind with childhood. I also wanted to tell you, kindness and love mattered most in my life and I hope your have found that they matter most. If anything goes on after this life, I am hoping it is the love that caring people feel for each other. It is my biggest hope that as you have grown from the toddler I held in my arms to the young man reading this you have known love, lots of love. Tip six: Keep the letters short, try to include one or two memories, not just of good behavior, but as the child grows applaud struggles and learning, provide sympathy and support. Tip seven: Think of adding a picture or mememto. To keep you strong, writing such letters focuses you on what matters, your mission as a parent, your hopes and dreams for each of your children. When you are clear about your mission as a parent, and what you hope for each child, you become a mission driven parent which means you go for the good, not the gold – you know what matters. For more about missions consider buying my newest eBook, Know Your Mission So You Can Reach Your Goals. It is available on Amazon and can be downloaded to your computer to read. I think it is the most important book I have written and costs less than a Dairy Queen Special and is better for body and soul. Care and share and thank you. This entry was posted in Parenting Issues and tagged Emotional fitness, Goals, Goodbye letter, Katherine Gordy Levine, Know Your Mission So You Can Reach Your Goals, Life, Mission, Missions, Parenting advice, parenting teenagers, postaday. Bookmark the permalink. What a lovely idea. I think I will do it. Maybe for my grandchildren as well. Thanks so much.